Dropbox has just acquired MobileSpan, a startup that helps enterprise employees access corporate firewalled content securely. MobileSpan will shut down at the end of 2014, and active development will cease immediately. Dropbox has spent the last year-and-a-half concentrating on making its Dropbox For Business product secure enough for big enterprises. MobileSpan’s knowledge of the bring-your-own-device world will bolster that push. Dropbox confirms to me that all four MobileSpan team members are coming aboard, and that this is a full-fledged acquisition so tech is coming along with the talent. The buy follows Dropbox’s purchase of DropTalk last week as it seeks to fill holes in its product through acquisitions instead of slowly building things in-house. MobileSpan had raised just $2.3 million from investors True Ventures and K9 Ventures since its start in 2011. 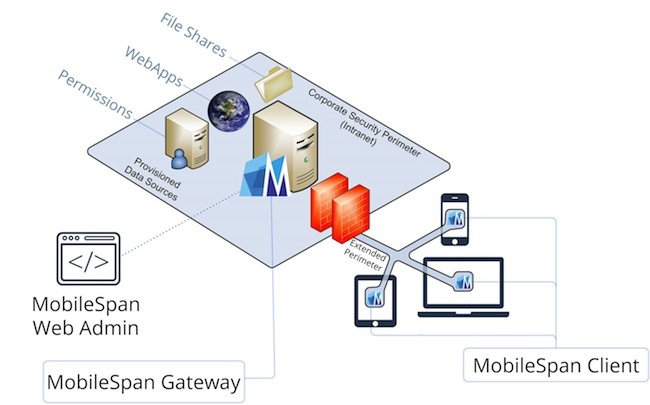 The way it worked was that companies would install the MobileSpan gateway at an on-premises Windows server and distribute the MobileSpan for iOS and MobileSpan for Windows desktop apps to their employees. Once approved by IT, employees could access the specific documents, folders and applications relevant to their work. The idea was to secure the connection rather than lock down a user’s device, making BYOD much simpler. Due to device fragmentation, it’s tough to scale to work on every mobile handset and laptop. With Dropbox’s help, though, MobileSpan’s team could quickly build apps for more operating systems so employees can get to their work files no matter what device they’re packing. “…We still have some ways to go before business content is freed from its desktop-focused roots and is made readily usable yet secure on modern mobile devices. Joining forces with Dropbox will allow us to rapidly accelerate the realization of that dream. Dropbox isn’t the only one with that dream. It’s battling Box, Microsoft, Google and more in the fight to provide enterprise cloud storage, access and collaboration. The problem has been that Dropbox’s consumer-focused product was seen as inadequate for serious business, as I detailed in my feature on Dropbox’s growing pains. It didn’t have the security or permissioning for big enterprises to feel safe providing employees with differing levels of access to confidential files via Dropbox. But as our enterprise expert Ron Miller wrote last week, the company is hard at work to become a respected corporate software provider and fix “The Dropbox Problem.” That’s when enterprise employees store work files in their personal Dropboxes in a way that makes security-minded CIOs squirm. The MobileSpan acquisition could go a long way to making Dropbox the lockbox that corporations crave.